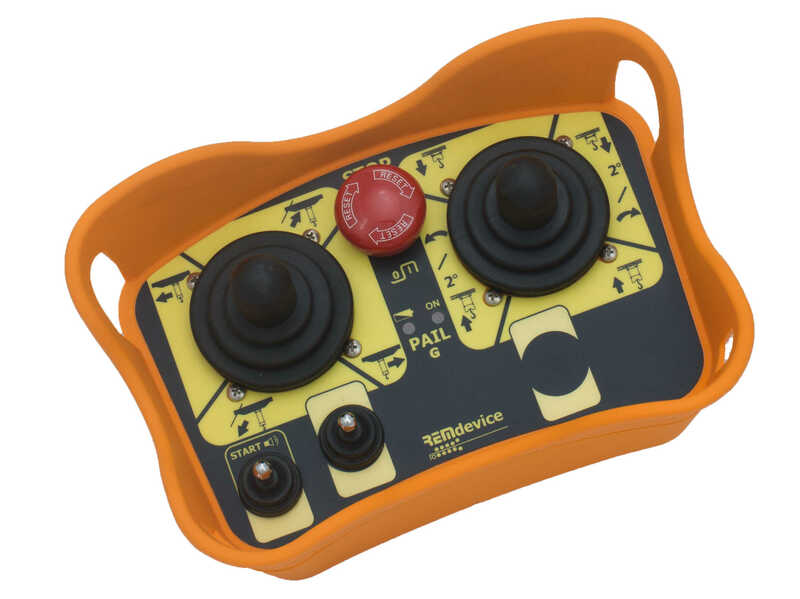 The Pail radio remote control is a joystick controller with belly-box transmitter, available in standard configurations for cranes and bridge cranes, or in customized versions adaptable to nearly any remote control requirement. Specifically designed to withstand accidental drops and falls, the Pail is sturdy, handy and user friendly. Rated for temperatures from -20°C to +70°C (-4° to 158°F) and classified IP65, the Pail is ready for all weather conditions. The nylon case is rugged, anti-slip and resistant to acids, oils and other harmful chemicals. A graphic display is available showing up to 15 screens with data and programmable alarms. Operational data is stored on the receiver (working hours, total # of startups/shut-downs, number of lift or movements. The patented electromagnetic induction charging system does not need to be plugged in, just place the Pail on the charger. A 20 minute charge is usually enough for a full day of use, while a full charge can cover a full week of operation. Up to 5 speeds hoisting, 4 speeds rotation, 4 speeds trolley and 2 speeds transverse are available in the standard configuration, with 3 auxiliary controls and data feedback showing crane parameters. Receivers are available for mounting inside another enclosure (RX DIN) or in an IP65 rated watertight case for outdoor installation (RX RubyBox). Each receiver comes with its own antenna. Directional and high gain antennas are also available on request.